CDRLabs has taken an in depth look at OCZ's 256GB Vector solid state drive. 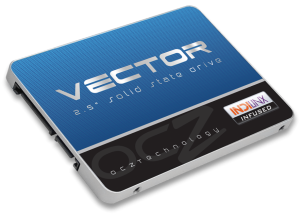 Available in capacities ranging from 128GB up to 512GB, the Vector is based on OCZ's new Indilinx Barefoot 3 controller. Developed entirely in-house, this cutting-edge controller is powered by both an ARM Cortex processor and OCZ's own Aragon co-processor and features an advanced, multi-level ECC engine, efficient garbage collection and adaptive ﬂash management algorithms. The Vector is also equipped with 25nm synchronous MLC NAND and an extra large DRAM cache to deliver up to 550MB/s read and 530MB/s write speeds along with a maximum of 95,000 4KB random write IOPS. Looks like a very good product. I´m still a bit critical about OCZ, but it looks they are on a good way. Bit still the newer OCZ-SSDs are pricey, so I don´t buy this or the Vertex 4. I'm not really sure where the premium price tag is coming from. Given, the outer casing is a lot nicer, but that really doesn't justify the cost to me. If I had to guess, they're recouping the cost of developing the Barefoot 3. If they continue to use it in future drives, the cost will hopefully come down. I haven't heard of OCZ buying lesser quality chips like some of the Chinese manufacturers. I'm pretty sure they're just the usual, run of the mill Intel/Micron chips with the OCZ logo airbrushed on. OCZ uses in the past lower NAND-quality, if I remember correct, in Vertex/Agility 2 (and maybe 3), Petrol and Octane; they also switched in some cases the NAND-quality after some good reviews.